Here's an actual screen capture showing how a BVP-4 can help your tapes! You can boost colors in a tape that's very washed out! It passes a very clean, low noise video signal and usually can provide a substantial boost in visual quality to your analog video. An excellent tool. Condition: Used, this BVP-4+ has been fully tested and refurbished, we guarantee this unit to be fully functional and in good working order. Metal cover is in nice condition. 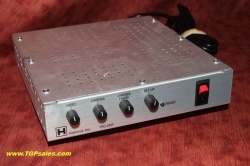 Plug-in power supply is a replacement having the same exact specifications as original. For the highest quality results we recommend that you transfer video tapes using S-Video connections all the way through the transfer. This unit is optimized for s-Video. 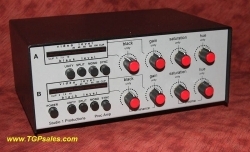 If you just plan on using just composite (RCA) video you'll be better served by using the lower priced Vidicraft Proc Amp and Detailers these units offer better detail when using composite (RCA) video only. 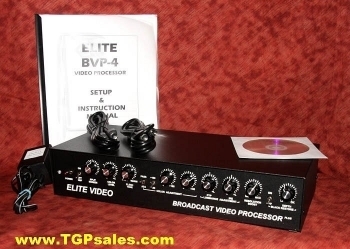 The BVP-4 accepts either NTSC composite or S-video inputs. Outputs are NTSC composite and S-video, and both outputs are active at the same time. For best quality TGrant Photo recommends using only the s-video connectors. - Herringbone noise filter reduces noise caused by electrical interference. 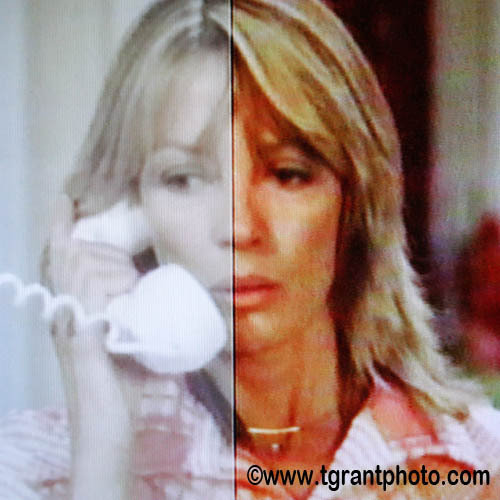 - Split Screen allows you to instantly see the "before and after" when you make changes to the picture. See our photo above that shows how you can bring color into a washed out image! - Color Level lets you take away any amount of color you desire, enliven dull video or prevent color smear. You can even go to black and white. - Flesh tone automatically restores reddish tone skin back to natural tone that it is in real life. - Tint Adjustment gives you 360 degrees of full color correction. Easily fix video whose color is wrong without affecting the blacks or whites. - Point to Point Luminance allows you to brighten your signal without losing contrast. 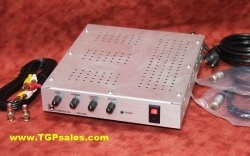 Get up to 9db gain in your signal! "Gain up" without bringing the grain up! - IRE Adjustment lets you bring up the video level of the whole screen. From black to white and everything in between. - Resolution Boost gives you up to 90 lines more resolution with special enhancement technology. - The BVP-4 PLUS has 1200 lines of resolution. - The BVP-4 PLUS has self-adaptive resolution - which means that once you set the amount of resolution boost you need, you simply let the BVP-4 do the rest. (see above tgrantphoto.com example photo) The BVP-4 adjusts how much resolution enhancement you need based on the values of the video passing through the processor. 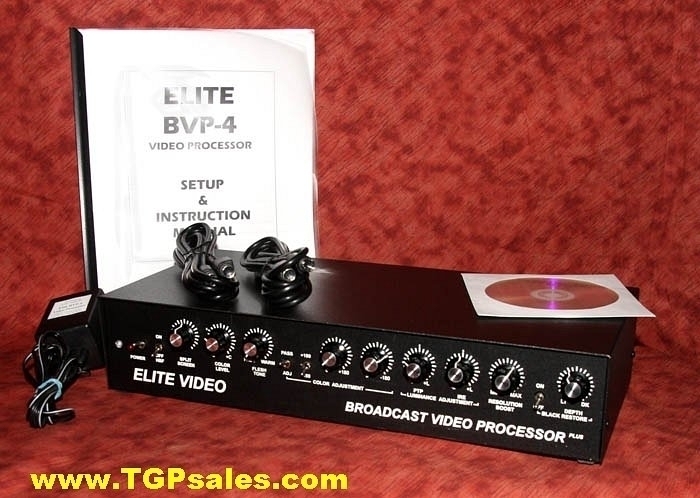 - The BVP-4 PLUS has a digital gamma compensator circuit - This circuit is controllable by a switch on the back of the BVP-4 PLUS. Turn the switch on when you have an input from a digital camcorder such as the Sony DV1000. This feature will give you a greater degree of highlights and detail in the shadow and dark areas of the picture. This detail can be lost due to the compression ratio systems of the digital format. The circuit in the BVP-4 PLUS helps restore the detail that was lost. Approx. dimensions: 15" x 7.5" x 3" weight about 9 lbs. Sale Price: $274.95 / ea You Save: $15.00 (5.17%)!